The Agricultural Research Service (ARS) serves as the U.S. Department of Agriculture’s (USDA) primary scientific research agency. ARS conducts research to provide solutions to “agricultural problems of high national priority” and “to ensure the security of production systems.” ARS aims to create “new technologies, new and improved management practices, pest management strategies, sustainable production systems, and methods of controlling potential contaminants.” One of ARS’ main programs is “Animal Production and Protection”—intended to improve animal production methods and protect farm animals against “production-related diseases.” The research centers on maintaining and increasing the animal-based food supply for humans, resulting in an involved relationship between agricultural research and the industrialized farm animal production or “factory farm” system. Commonly used species include fish, pigs, cows, sheep, and birds—particularly chickens. Many studies focus on finding cheaper and faster ways to grow animals for food and fiber, along with testing artificial diets and reproduction methods. Genetic engineering and cloning are frequently used and many animals are killed simply for data collection on gene activity. For example, experiments involving domestic fowl (i.e. chickens, turkeys, and ducks) are related to efforts to exploit further their use for meat and egg production. Birds are used in experiments involving partial beak amputation, forced molting, food deprivation and starvation, heat stress, feather pulling, genetic engineering, cloning and growth manipulation. They are also used to devise and test various slaughtering methods. In one past study sponsored by the USDA, 250 hens were subjected to electric shocks prior to being killed, to determine if the flesh from their breasts would be easier to remove. Using gene manipulation, scientists have created featherless chickens and attempted to engineer bigger, leaner “superpigs.” Both attempts have resulted in producing animals with physiological abnormalities and physical deformities, leading to enormous suffering for the untold number of animals involved. Agricultural research also studies the causes and treatments of diseases associated with factory farming, like avian influenza, mad cow disease, swine flu, and antibiotic resistance. Since many of these diseases can be transmitted to humans, additional research is carried out to find vaccines and other treatments for human protection. The perceived threat to humans from these diseases therefore conveniently supports the general use of farm animals for human health research. 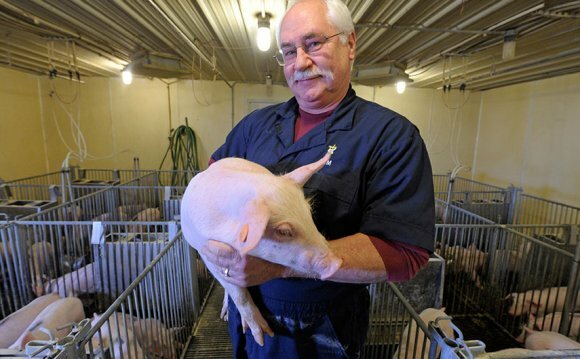 Examples of research studies include the use of pigs for cardiovascular and hormone research, cows for artificial insemination methods and in vitro fertilization, sheep for studying fetal nutrition during pregnancy, chickens for ovarian cancer and breast cancer research, and dairy cows for mammary gland development research. The body parts or by-products of euthanized and slaughtered farm animals are also used for dissections in schools and for product and drug testing. Today, agricultural scientists are pushing the federal government to increase the amount of funding allocated to agricultural research. In 2007, the USDA awarded university scientists $32 million to study livestock and dozens of universities currently raise farm animals for agricultural research When the studies end, the animals who have not been given experimental drugs are slaughtered and the money made from slaughtering them becomes additional revenue. The partnership between the research and factory farming industries allows both parties to benefit and continue in the cycle of animal use and abuse. For instance, the link between the agricultural use of domestic fowl and their use in biomedical research is close and longstanding. Poultry production companies offer research labs a virtually endless supply of easily replaceable test subjects. Domestic fowl/farm birds have been and continue to be widely used in research because they are cheap, readily available, and are easily bred and managed. Birds are often used for research because their developing embryos can be studied, vivisected, and manipulated outside of the mother. Like mice, rats, and birds, farm animals who are “used or intended for use for improving animal nutrition, breeding, management, or production efficiency, or for improving the quality of food or fiber” are excluded from protection under the Animal Welfare Act (AWA). Alphabet Road - "F" Is For Farm - "Farm Animals"